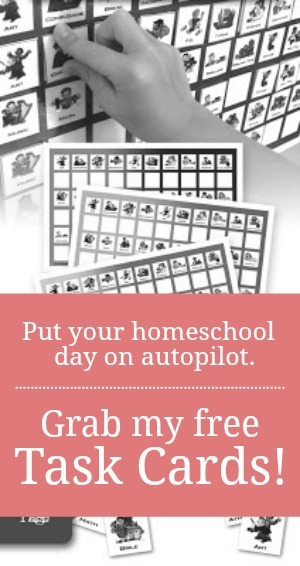 While I would love to don my Super-Homeschool Momma cape and effortlessly complete all of the needed tasks of playing wife, mother, and teacher five-days-a-week, I know there are only so many hours in the school week with which to complete all those tasks and only one of me to complete them. And besides, the Super-Homeschool Momma cape that I ordered seven years ago when I started this "little thing" called homeschooling is still on back order. I'm not expecting it to arrive anytime soon! So, what's an Average-Homeschool Momma to do when she faces a lengthy list of homeschool To Dos and an equally lengthy list of housewife To Dos? As I mentioned in my 5 Days of Scheduling Your Entire Homeschool Year series, I only homeschool four days a week. The fifth day (in a traditional school week) has become a much-needed buffer. That is not to say that learning comes to a screeching halt on Day 5. On the contrary. It just develops more organically in the form of cooperative learning, social interaction (Phew! Now I can check "socialization" off of my "Raising normal, American kids" list. ), life-skills practice (that's just a fancy way of saying "chores"), and slowing down to enjoy one another. I never want to spend my days feeling like I am always behind...in school, at home, in life. So, by affording myself the luxury of having a buffer day, I am ensuring that I can wear both the momma hat and the teacher hat well. Please join me next Monday when I share how I pack five days of learning into four days...and still stay sane! Oops...I guess I hit the wrong date on my scheduling calendar. This wasn't suppose to air until Monday morning. Oh well, I guess it made for a Sunday night surprise. I can't wait to read your next post. I so often feel torn and pressured with all of my different roles-like I can never give 100% to any of them and that life is just flying by me. I look forward to seeing how you manage it. What a great post. Thanks! I'm looking forward to next Monday. That's actually how our four day a week schedule got started to. Thanks for your post! We have a preschooler & a kindergartener & we also school 4 days a week. I was hoping to continue in this tradition with the coming years, but wasn't sure if it was going to be possible. Glad to see it's working for you guys! This is reassuring to see that others are doing this. We formally school on M,T,Th,F. Weds my oldest (first grade) goes to a nature school and the younger kids just play. Not sure if I do much catching up except I am able to usually run an errand or two. But I find that this schedule is working well for us. Thank you for your efforts in putting these wonderful posts/videos together - being a first year home-school mum my mind is in the place of 'can this actually be done?' with practical ideas like this it is very encouraging...thank you again. Love this! We do the same thing, it's our "field trip" day, the park, library, museum, pool, etc... That's the great thing about homeschooling, children learn even if it's not in a structured formal setting and if you add up the hours of creative play, reading, lessons, life-skills etc...they far exceed public school hours. Can't wait to hear the "How" you do it.We did this last year but by doubling up on subject assignments throughout the week, however, this year I have found that it is just too much for my younger learners. But, I am really missing having that "catch up" day or "let's do something fun" day! 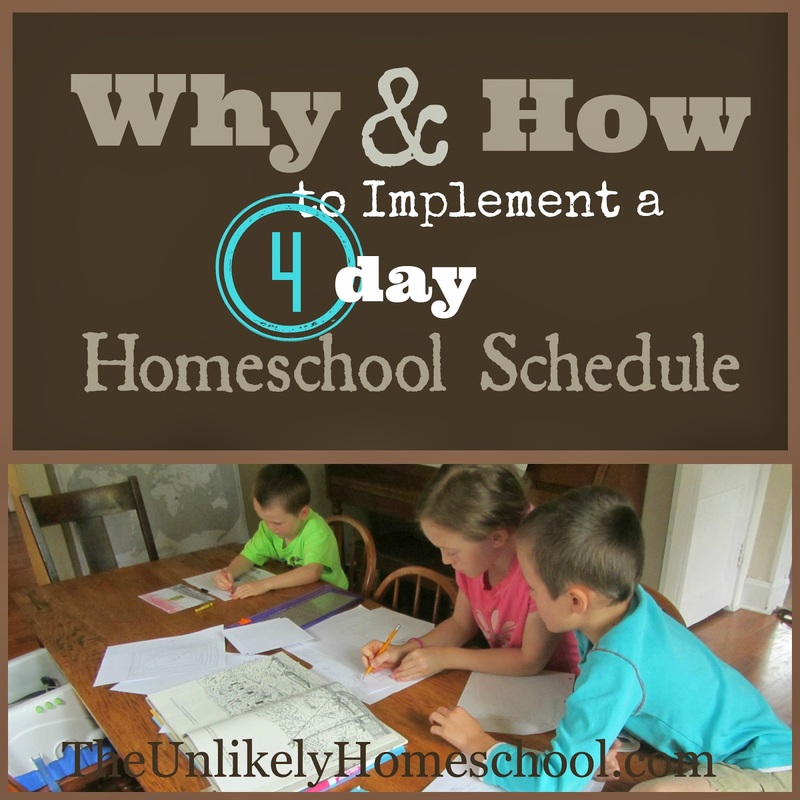 I enjoy a 4-day homeschool week as well. Great post. Shared it. We also have a 4 day school week. We use Mondays to recover from our weekend. :D And now that my kids are in high school, they do their school work at different hours of the day that best suit their schedules. Which is another kettle of fish entirely. We're getting into a little bit of that also. My daughter babysits one morning a week for a young family in our church and has to adjust her school schedule to accommodate.